The Internet, mobile services and connected devices are more and more viewed as a natural part of our daily communication and machine interaction. Therefore, the devices and services are increasingly fusing with our environment. Gesture and voice control are becoming more popular. In 2016 Microsoft CEO Satya Nadella called voice control as conversation as an interface. But these control methods are not always possible or appropriate. 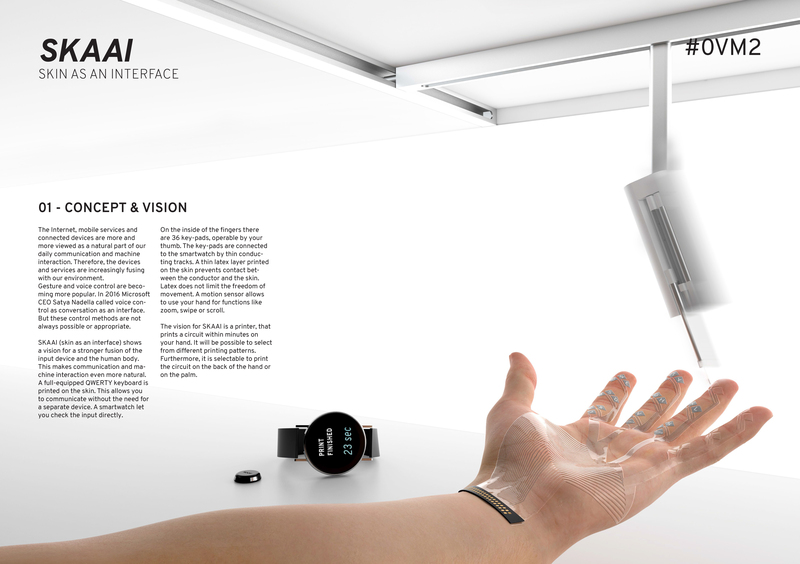 SKAAI (skin as an interface) shows a vision for a stronger fusion of the input device and the human body. This makes communication and machine interaction even more natural. A full-equipped QWERTY keyboard is printed on the skin. This allows you to communicate without the need for a separate device. A smartwatch let you check the input directly. On the inside of the fingers there are 36 key-pads, operable by your thumb. The key-pads are connected to the smartwatch by thin conducting tracks. A thin latex layer printed on the skin prevents contact between the conductor and the skin. Latex does not limit the freedom of movement. 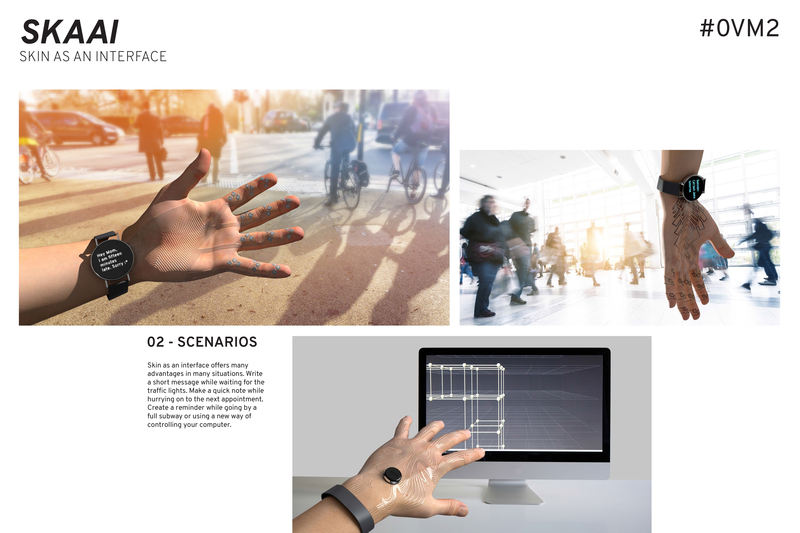 A motion sensor allows to use your hand for functions like zoom, swipe or scroll. 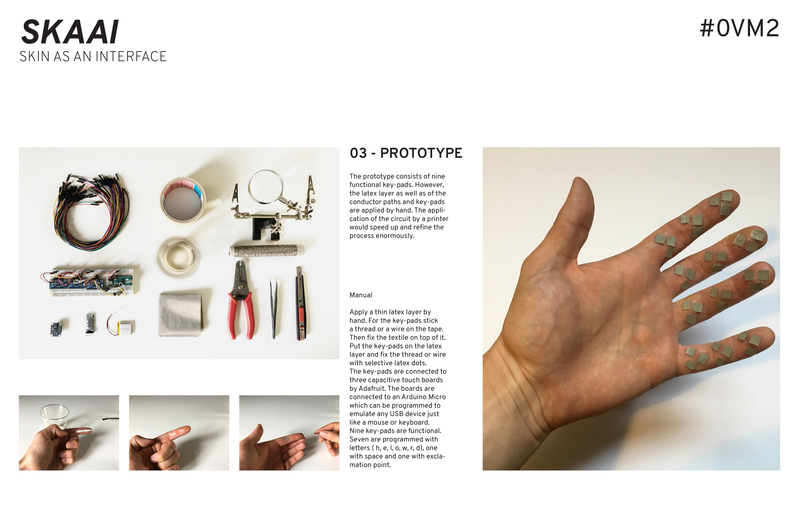 The vision for SKAAI is a printer, that prints a circuit within minutes on your hand. It will be possible to select from different printing patterns. Furthermore, it is selectable to print the circuit on the back of the hand or on the palm. Skin as an interface offers many advantages in many situations. Write a short message while waiting for the traffic lights. Make a quick note while hurrying on to the next appointment. Create a reminder while going by a full subway or using a new way of controlling your computer. The prototype consists of nine functional key-pads. However, the latex layer as well as of the conductor paths and key-pads are applied by hand. The application of the circuit by a printer would speed up and refine the process enormously.